Toronto, ON – Kawasaki, Japan and Toronto, Canada, September 20, 2017 Fujitsu Laboratories Ltd. and the University of Toronto have entered into a new partnership, with Fujitsu Laboratories establishing a new research center in Toronto focused on bolstering R&D into breakthrough quantum computing technologies. In a wide variety of fields, including healthcare, finance, logistics, public policy, there exists an enormous amount of extraordinarily complex problems that require rapid decision making, yet cannot be solved in a realistic time-frame with current computing technologies. To address these issues, it is necessary to develop both revolutionary new computing technologies, and the software needed to apply these technologies in society. By entering into this strategic partnership, Fujitsu Laboratories and the University of Toronto aim to accelerate the practical use of quantum computing technologies for high-speed solutions to difficult real-world issues by further developing the technologies that they have been cultivating until now. Along with the development of increasingly innovative computing technologies in the future, both will further contribute to finding solutions to global social, economic, and industrial issues. Fujitsu Laboratories and the University of Toronto have been building a close relationship in research work for computing performance improvement for over eighteen years. Now, Fujitsu Laboratories’ research center will be built in Toronto, a fitting location for the verification of the accomplishments of cutting-edge research, delivering a mutually beneficial outcome that will take cooperation between Fujitsu and the University of Toronto to an even greater level. While continuing to promote this research, both teams will integrate their world-class insights and research and development capabilities–in which they excel–with a core focus on quantum computing moving forward, and expand their fields of research. The era of Artificial Intelligence is in full swing, and Fujitsu Laboratories has taken note. It is promoting the development of domain-specific computing,(1) which is a computing technology that demonstrates the performance optimized to each specific field of a target issue, as a part of a research strategy that includes not only software but also architecture and hardware. 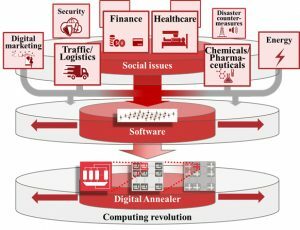 Fujitsu has also developed Digital Annealer,(2) which is a new architecture that rivals current quantum computers in handling an array of real-world issues, while leading the development of advanced technologies in fields requiring quantum computing technologies. The University of Toronto is among the world’s top ranked research universities with internationally recognized strengths in quantum-inspired computing and artificial intelligence, such as the Centre for Quantum Information and Quantum Computing (CQIQC) and the newly established independent Vector Institute for Artificial Intelligence, which the University of Toronto helped create. This year, QS ranked the University of Toronto 10th in the world in the field of Computer Science and Information Systems and 34th in the field of Engineering and Technology, while the independent Shanghai Ranking Consultancy placed U of T 13th globally in the field of Computer Science and Engineering. The University of Toronto also has world-class researchers working in healthcare, biology, finance, security, as well as in facilitating the application of engineering technologies within society. There are many real-world problems which cannot be handled by current computing technologies on a practical level. This includes cases such as those that require complicated decision-making and have been performed by humans until now, or those in which optimal combinations of data are selected from large amounts of input data for learning. Next, there is the amount of computation, which in cases that lead to optimal solutions with regard to various factors, increases exponentially in line with the number of those factors. For instance, in problems where the optimal combination is selected, if the number of elements increases by just one hundred, the number of possible combinations becomes more than one quadrillion times 10 to the 15th power. This type of problem proves challenging to current computers. At the same time, real-world problems, like the optimization of investment portfolios and logistics, or enacting an industrial policy that adequately deals with global environmental problems, are becoming increasingly complex and demand the rapid discovery of solutions. The development of new computing technologies is desired in order to meet these demands. Fujitsu Laboratories and the University of Toronto will begin by enhancing Digital Annealer that they have both developed, and expand its applicable scope and function to a level that allows it to handle a wide variety of real-world issues. At the same time, leveraging the advanced academic research expertise of the University of Toronto, Fujitsu Laboratories and the university will jointly develop application software that can be applied to problems in such real world fields as healthcare and finance, and thereby accelerate the practical use of this technology. One of the problems the partners will tackle moving forward is the optimization of doses in radiotherapy for cancer. In order to deliver sufficient radiation to cancer tissue while keeping radiation doses at levels safe for normal tissue based on CT images, a large number of optimization calculations must be perfromed. Because the patient must stay still during calculation, the calculation time is limited to several minutes. Making possible optimization calculations that can be performed in a short amount of time with high accuracy will alleviate the physical burden on the patient while maintaining their safety through the improvement of the treatment’s effectiveness and shortened duration of the treatment. Radiotherapy technology could be transformed by expanding on Digital Annealer and developing application software that can make computations within minutes. By proceeding with this kind of initiative, Fujitsu Laboratories and the University of Toronto will further develop Digital Annealer, and expand its implementation in the real world. In addition, to deepen close cooperation between researchers of both organizations, Fujitsu Laboratories and the University of Toronto will work as a driving force for creating a knowledge ecosystem of innovative computing technologies in Toronto and North America, contributing to the generation of new information and communication technology (ICT) business and the development of society and the economy. Remarks by Shigeru Sasaki, CEO, Fujitsu Laboratories Ltd.
Fujitsu Laboratories has been continuously leading the development of advanced technology in the field of ICT. We feel there is great importance in strengthening our ties with the University of Toronto, whose exceptionally talented people have achieved preeminent results in research not only in the field of computing but also healthcare, finance and other fields. I believe that by continuously presenting the results of our groundbreaking computing research to the world-including our quantum-inspired computing technology and beyond-the value of our technologies like AI and cloud computing will increase even further, and allow us to expand our business. This in turn will further advance the human-centric innovation that the Fujitsu Group promotes, and lead to the creation of a human-friendly and prosperous society, while contributing to social and economic development. The University of Toronto is incredibly proud of its association with Fujitsu Laboratories, and we look forward to the great things we will accomplish together in the years to come. The strategic partnership we’re embarking on today will strengthen and expand our collaboration, in concert with the establishment of Fujitsu Laboratories’ new research center in Toronto. It will accelerate our efforts to develop practical quantum-inspired computing technologies, and it will help us meet a vast range of social, economic, and industrial challenges in the 21st century. Founded in 1827, the University of Toronto has evolved into Canada’s leading institution of learning, discovery and knowledge creation. We are proud to be one of the world’s top research-intensive universities, driven to invent and innovate. The university offers 700 programs of study at its three campuses in the Greater Toronto Area and has full affiliations with nine teaching and research hospitals. For more information, visit utoronto.ca.